With respect to Machiavelli’s thought, the important facts about the second Italian War are these. The first Italian invasion (that of Charles VIII) was aimed at Naples and had little effect on Italian power Politics, except to cause the downfall of the Medici regime in Florence. That regime was replaced by a republic in which Machiavelli was Second Chancellor; and also made Florence a French ally. Charles planned a second invasion to reconquer and this time hold Naples, but he died in April of 1498, before he could return to Italy. 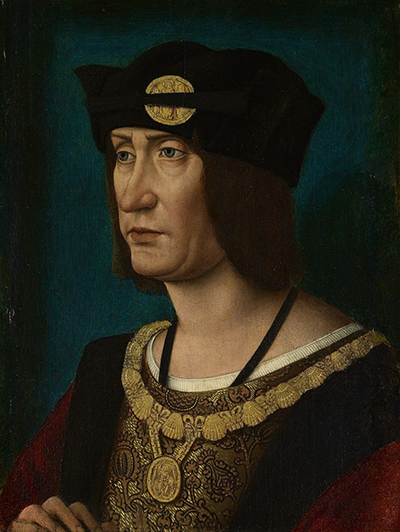 Charles was succeeded by Louis Duke of Orléans (1462 -1515), who not only inherited Charles claim to Naples, but had a claim to Milan through his family’s connection to the Visconti. Louis, reigning as Louis XII (1498 – 1515) promptly announced that he intended to press his claim to Milan. In contrast to his position during the first French invasion, Pope Alexander VI did not actively oppose Louis intentions. Rather, he took advantage of an opportunity created by Louis’s accession to strike a bargain that would in one stroke advance three of his goals: securing the Romagna, suppressing the Roman Barons, and advancing the career of his son Cesare Borgia. Alexander’s opportunity came about because Louis needed a divorce, which a sitting Pope was in a position to grant, so that he could marry Charles VIII’s widow Anne of Brittany and thus ensure that the province remained part of the French crown domains. Cesare would gain (A) the Duchy of Valence, (B) Marriage with Charlotte d’Albert, the sister of the King of Navarre, and (C) French troops for his conquest of the Romagna. With Valance, Cesare acquired the title by which Niccolò often referred to him, Duke Valentino. Louis would gain (A) his divorce (B) a Cardinal’s hat for a favorite counselor, George d’Amboise, (C) Cesare’s assistance in Louis’s planned invasion of Milan. This latter point arose from Cesare’s marriage contract. Alexander did not agree to ally the Papal States with France against Milan [Mallet and Shaw, p 43]. Machiavelli’s position was a minority view, but not an isolated one. It was also shared by the Doge of Venice, who had unsuccessfully opposed the partition agreement. Louis also made preparatory agreements to secure his frontiers with the Empire, England, Ferdinand and Isabella, among others, and reached an agreement to hire Swiss infantry. On 15 July 1499, French troops, bolstered by the Swiss mercenaries, under the command of the Italian condottiero Gian Giacomo Trivulzio, invaded the territory of Milan [Mallett and Shaw p47]. Machiavelli considered the French practice of supplementing its forces with Swiss infantry a weakness that produced an inferior “mixed” army (Chapter 13). This mixed force was, however, still vastly superior to the Italian opposition, which relied solely on mercenary troops. While Louis carefully prepared for the invasion, Ludovico neglected both defensive and offensive preparations for war, and focused his efforts on diplomatic stratagems that often involved his offering large financial incentives. French forces quickly overran Milan. Ludovico fled to the protection of his father-in-law, the Emperor Maximillian. He staged a counter offensive, but was quickly defeated in a battle at Novara. Ludovico’s defeat, or at least the swiftness of it, was caused by the defection of his Swiss and German mercenaries. He was captured, and ended his life in a French prison. Louis pushed on to Naples. But Louis’ partition agreement with Ferdinand of Aragon did not hold. Ferdinand’s forces quickly forced him from Naples. Thus, in Naples, Louis was dominated by the very (powerful foreigner) that he himself had invited into the Kingdom. Machiavelli contended that Louis would have been better off to have restricted his efforts to holding Milan and to have left King Federigo on his thrown. "The wish to acquire is in truth very natural and common, and men always do so when they can, and for this they will be praised not blamed; but when they cannot do so, yet wish to do so by any means, then there is folly and blame. Therefore, if France could have attacked Naples with her own forces she ought to have done so; if she could not, then she ought not to have divided it. And if the partition which she made with the Venetians in Lombardy was justified by the excuse that by it she got a foothold in Italy, this other partition merited blame, for it had not the excuse of that necessity."